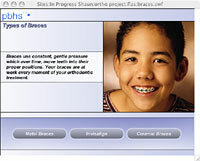 Translucent or clear ceramic braces are the most popular with adults. You have to be very close to someone to be able to see them. And because they are a ceramic material, they are more fragile.